The other day I found myself back at our local farm-stand, Frazier Farms. This time it wasn’t just corn I was after. I’d gotten an email that they had Conch Peas! 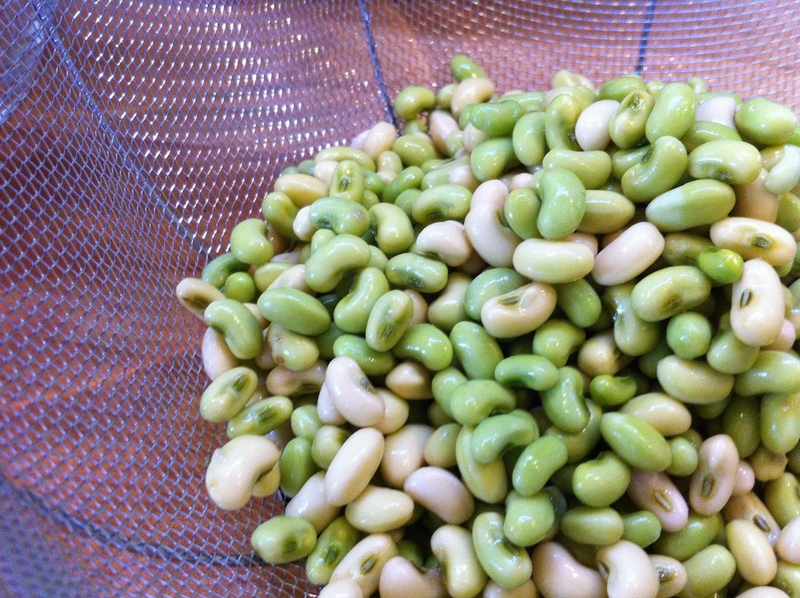 Fresh conch peas are a Southern specialty and very hard to come by. They’re delicate and only available fresh for a short time each year. Pricey too, but when you consider what you pay the grocery store for a simple tomato ($4.50+/lb !!)? …these are peas,…that have to be picked individually, shelled from their little pods, and weighed out into bags. Ugh – ok, $5.60/lb ? – Yes, please! The kids helped me gather some corn – this time there was both Sweet Yellow and Silver Queen corn. I can only handle about 12 ears at a time, between freezing and dinner options. Tonight we had a dinner guest, who’d never had them, so I thought I’d cook up some of those yummy peas. Most Southern cooks will boil the peas to serve. Ms.Sharon at Fraziers had said to use chicken stock and toss in a bit of fresh okra – boy, did that sound good! 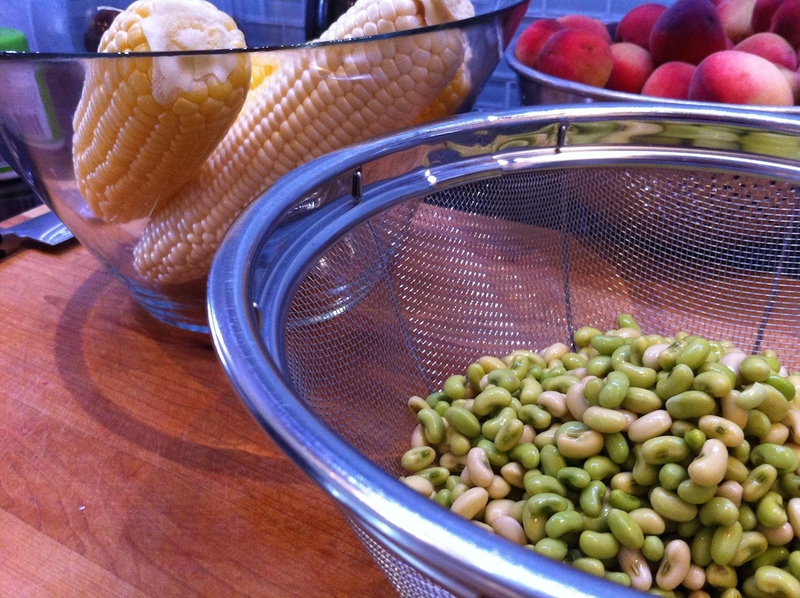 Maybe next time – I did buy 5 lb of peas! I wanted to do something a bit unexpected. 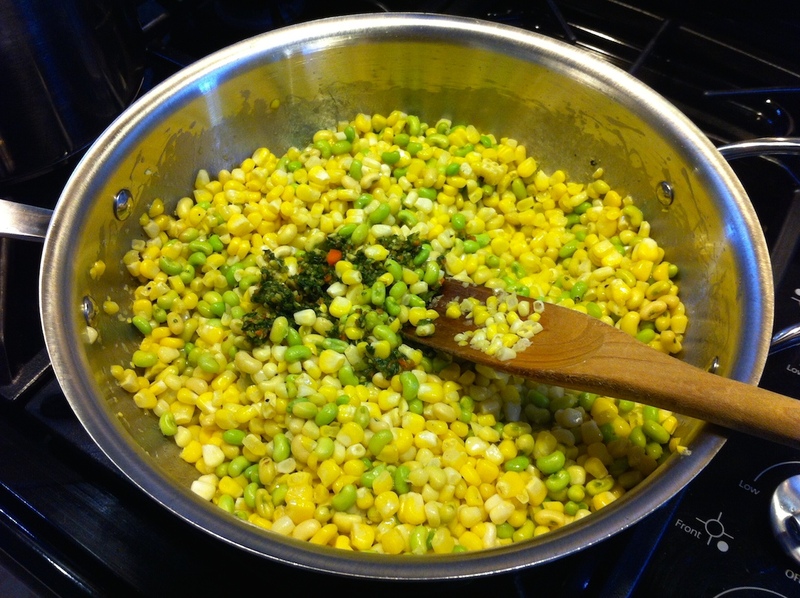 The other day I made a delicious ‘Sautéed Corn’. 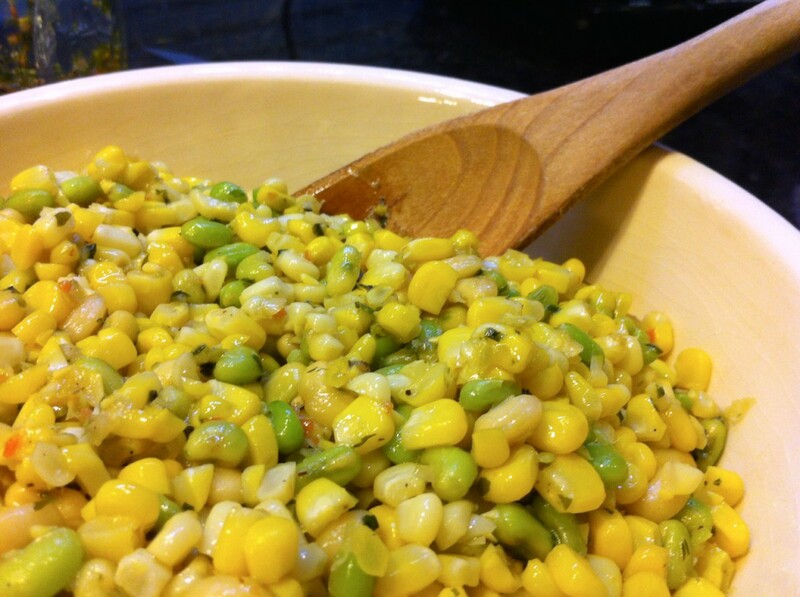 Super simple, fresh corn off the cob tossed into a skillet with butter, salt & pepper. Then sautéed until golden. OMG – so good! Could it be better with the addition of Conch Peas? I think so. Cut the corn from the cob and rinse the peas. Dig out that jar of ‘Salted Herbs’ from the fridge. In a large skillet, over med-high heat, melt the butter and add a bit of pepper (salt is later). 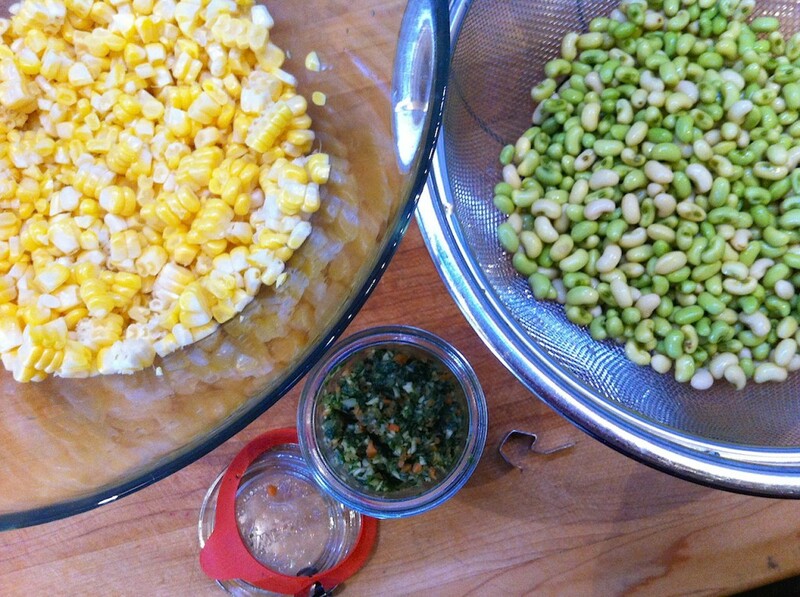 Get the Corn and Peas cooking. 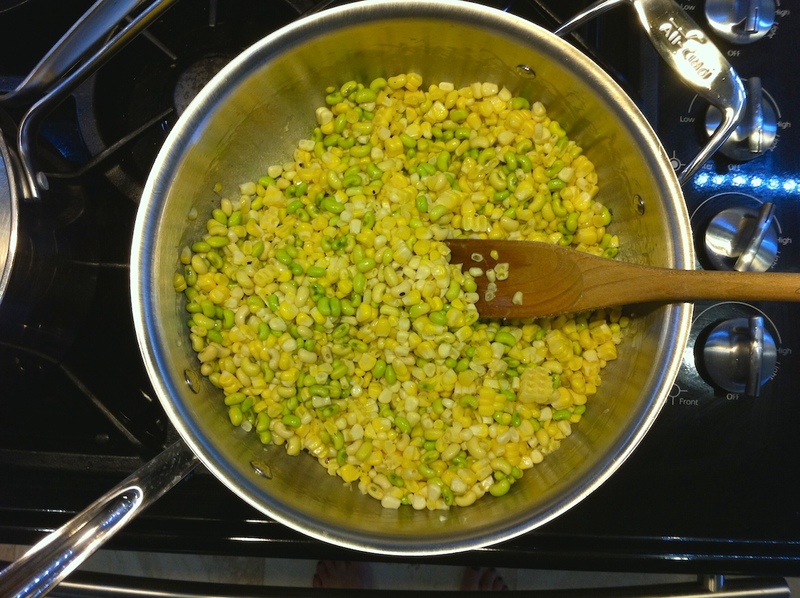 The corn will release some of it’s juice and will make a delicate sauce. Along with the butter, it’ll coat the veggies as they cook. After about 5 min of cooking, add in the Salted Herbs. Continue to cook another 5 – 8 min. The herbs will give the dish some more flavor and adds salt. Give it a taste before serving, you may want more regular salt. If you don’t have the herbs, I might suggest some finely minced parsley, or cilantro (if you’re a fan). That’s it ! Everything has a fresh taste !! And what’s better than fresh buttered corn ? Fresh buttered conch peas! Enjoy those peas while they’re still available – I’ll be freezing some of mine today – or something else, I haven’t decided what. 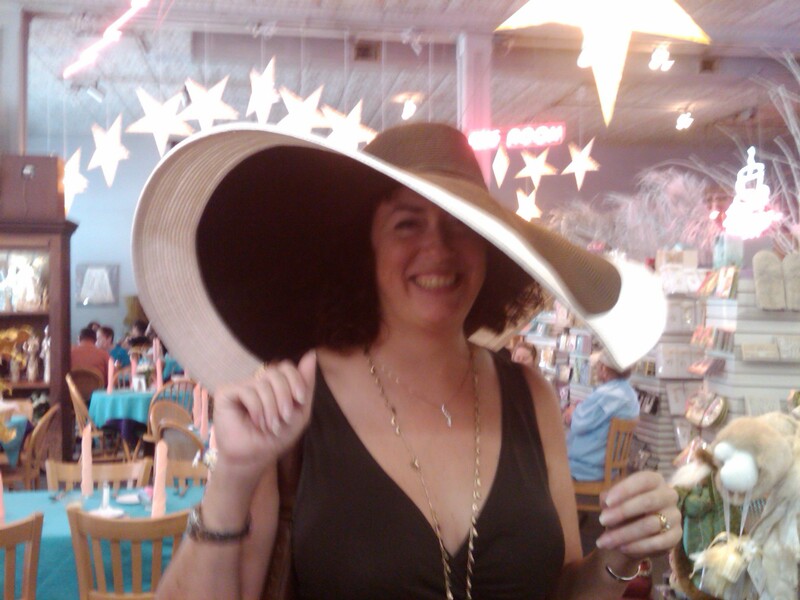 Well, I’m in Florida, so I really don’t have anywhere to send you – sorry. If I find that they somehow ship them, I’ll clue you in next season. The peas are also known as “Lady Cream Peas.” You can find the bulk dried peas under the Camellia brand. Buy a pound from the website if you can’t find any seeds locally.